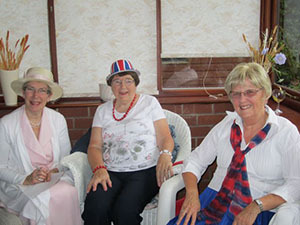 On Friday the 15th of July, Kelsall WI held our annual fundraising event, which took the form of a summer garden party in honour of the Queen’s Diamond Jubilee. 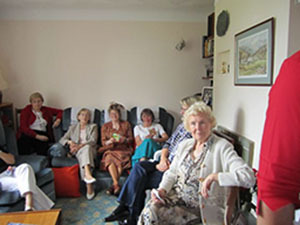 However, with the awful weather we have been having, there was very little 'summer' about the garden party, which had to be moved indoors, from Dot Berry’s garden into her house and garage. 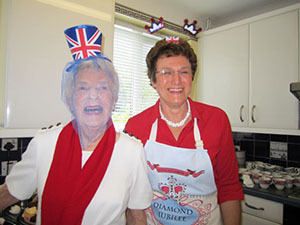 Dot had lovingly tended her garden in preparation for the event, but instead, about forty ladies invaded her house, which had been decorated during the morning with festive bunting and flags. 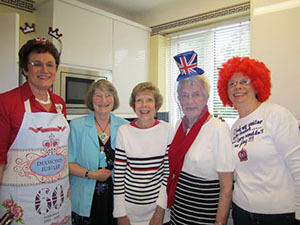 Our members arrived at 2.30, to be greeted with a glass of fruit punch, made by our president, Pat, from a secret recipe. 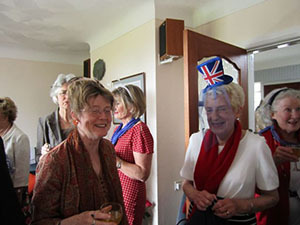 Everyone had made a real effort to dress up for the party, either in’ garden party’ attire, red white and blue colours, or in Margaret Davies’s case, a really ‘fun’ outfit (see photographs). 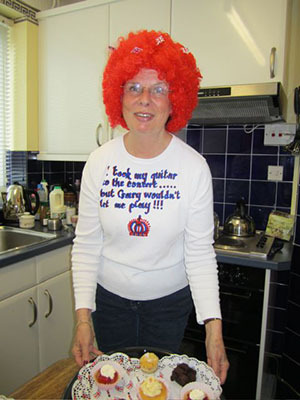 Margaret had really gone to town, dressing up as a rejected performer for the jubilee concert, complete with guitar and bright red wig. Margaret was unanimously voted winner of the “Most Original Ensemble “prize. We spent a very enjoyable afternoon chatting with each other whilst attempting the quiz and eating a great afternoon tea. 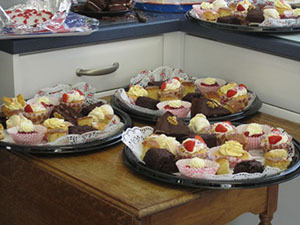 This comprised a selection of sandwiches and a fantastic array of cakes provided by our members . There were so many delicious cakes, too many to be eaten just in the afternoon, that more money was raised by selling packs of four cakes for a pound! The afternoon’s entertainment was completed by a raffle, and again, the prizes on offer were sufficiently numerous that not too many of us left empty–handed! As always, a great time was had by all, and a very big thank you is due to Dot for all the hard work involved in preparing her house and garden for the event, and being a great hostess.